G’day – Australia Day is for all Australians and our friends, no matter where our personal stories began. It offers a time to reflect on being Australian, celebrate contemporary Australia no matter where we are living and recognise our history. 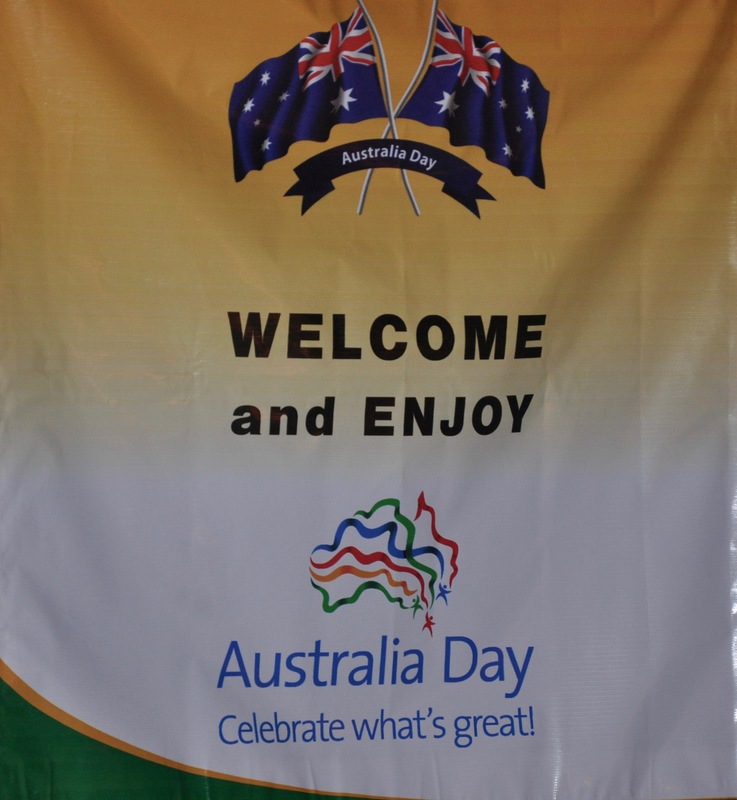 On Friday 26 January, some of our large Australian community in Chiang Mai got out to celebrate Australia Day. 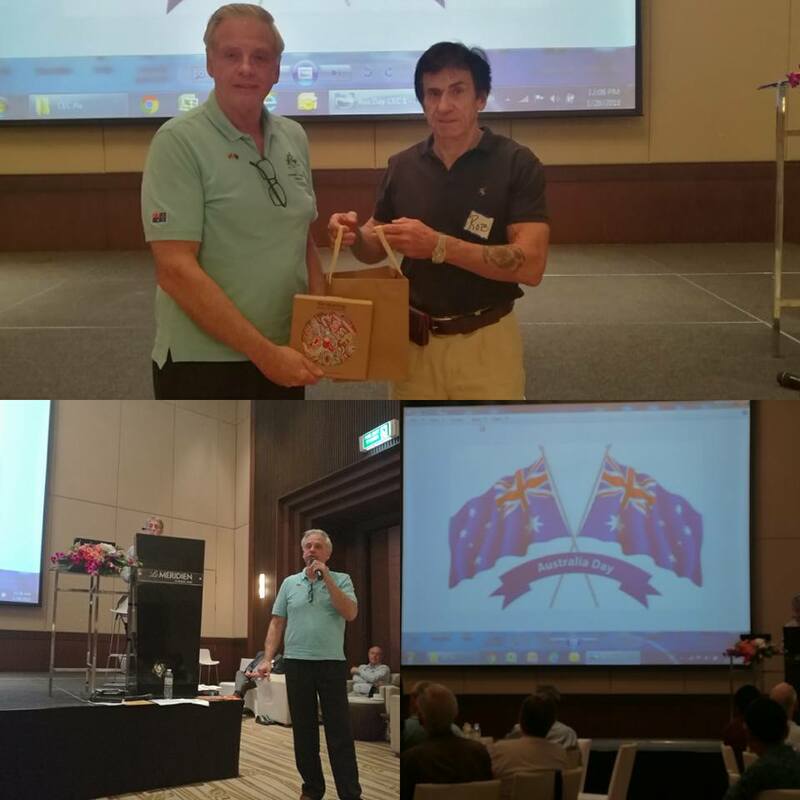 It’s was a chance to come together, socialise and enjoy – a bit of Australia in Thailand. 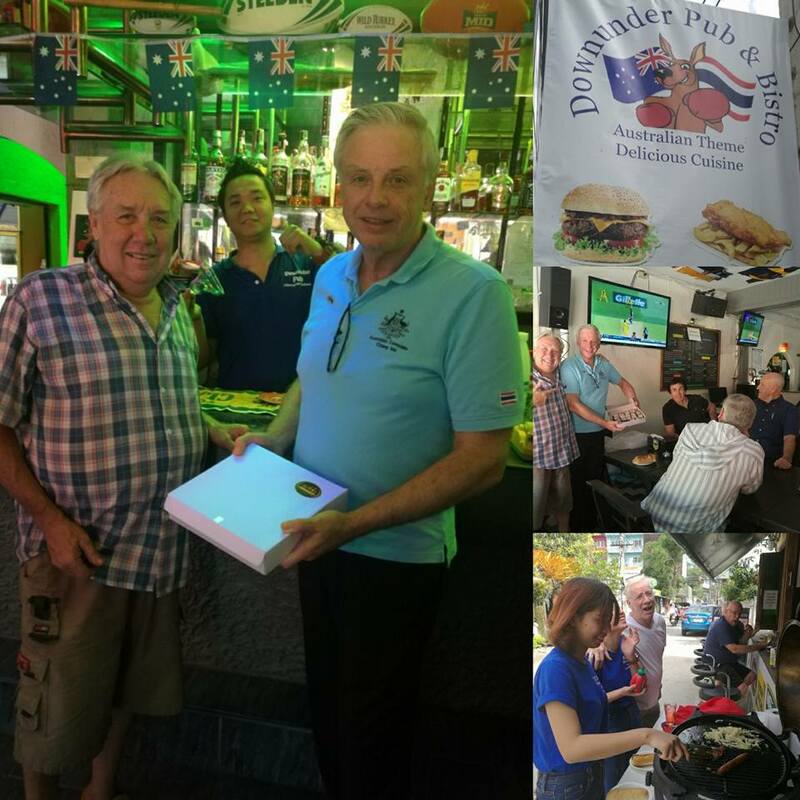 The Consulate wanted to participate and promote Australia Day activity in Chiang Mai so I went along, popping into 3 events to have fun and enjoy the Day. The general meeting at Le Meridien Hotel happened to be, unusually, on Friday so this was a chance for the Consulate to wish those attending a happy Australia Day. To add to the good wishes I was able to undertake a lucky draw for an Australiana gift prize thanks to our Embassy. Their prize involved some delicious Lamingtons I was able to source locally, an Aboriginal painting bone china plate, Aus music CD, kangaroo scarf and mini boomerang and embassy calendar & Aus/Thai flag pin. Given the large and diverse background of CEC members it was fantastic that an Aussie member was the winner. Congratulations. From their location on Loi Kroh Road the fun happened from 10.30am until late. After the Expat Club event I went along with some of the members for an Aussie lunch at the Downunder. They had a sausage BBQ going as well as classic Aussie meat pies. After some food and chatting I wondered around to offer Aussies & their friends some Lamingtons that I had picked up from Ko – JO Bakery. Feedback was they were super good Lamo’s! Thanks Torrie from Downunder Pub for putting on this event. This was an evening dinner and entertainment event on the Canal Road, heading towards Hangdong. From 6pm onward there were heaps of Australians and their friends in attendance. Everybody was welcome to join and many came along to have a bit of a laugh the Australian way! It was a great Aussie Day celebration. They offered an Aussie barbecue with snags, sausage rolls, steaks, big aussie burgers & meat pies as well as their normal menu. There was Aussie wine and other cold ones that were enjoyed by the crowd. To entertain guests there was some good old live classic Aussie music from Tony – looking “somewhat like Crocodile Dundee”?! There was also music from a local band. I was able to sponsor 4 lucky prize draws to add excitement to the celebration. It provided me the opportunity to meet and greet all the people who came on the night when giving out the lucky draw tickets. There were some great conversations had and stories told. Great Australian community networking opportunity. The Elephant Parade Chiangmai – Thanks Jeannette, for the Aussie Flag Elephant sculpture. Australian Consulate – thanks to our Embassy for Australiana items and Lo & Jo Bakery for the Lamingtons. You can find these supporting businesses around Chiangmai & locate them on FB or the internet. Thanks to Yummy Restaurant and the Downunder Pub for offering Aussie celebrations. 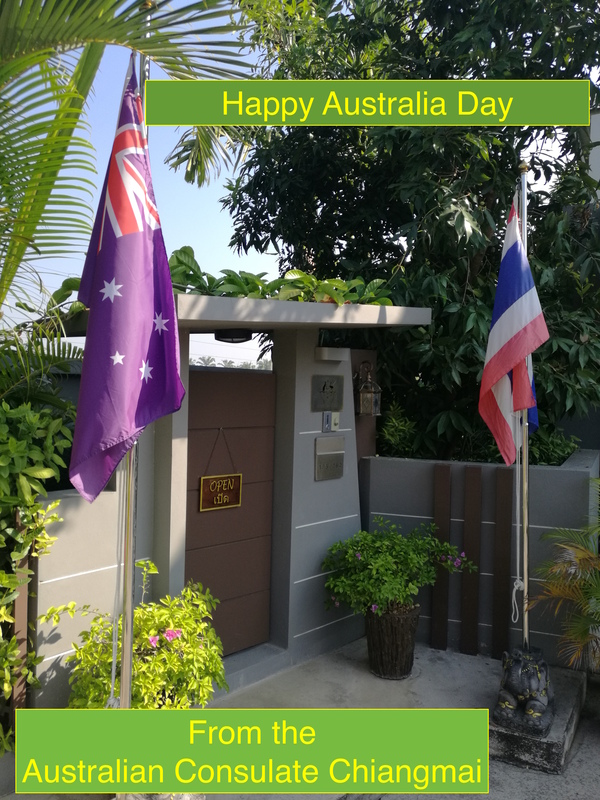 Happy Australia Day from the Australian Consulate Chiang Mai – until next year.